There are actually two different types of cross stitches -- long-armed and equal-armed -- both of which have been used in embroidery before 1600. 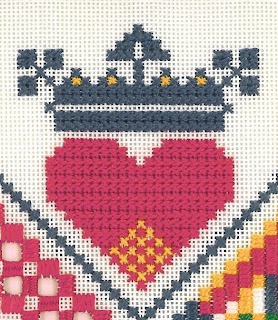 As seen in this modern Scandinavian motif, long-armed cross-stitch provides a wonderfully-textured surface in larger red and blue areas of the crowned heart while the equal-armed cross-stitch are used singly. To stitch a long-armed cross-stitch, the initial thread goes over two squares with the top stitch going back only over one square. 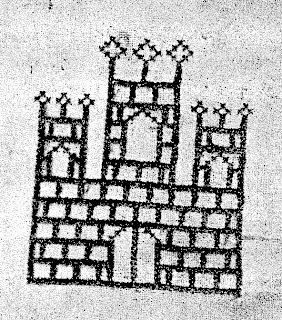 An historical example using both types of cross-stitch can be seen in a pillow found in the tomb of Ferdinand de la Cerda who died in 1275 CE in Spain. The original was stitched in silk and resides in the museum at Las Huelgas near Burgos. To see all the textiles from these amazing Spanish burials, see Manuel Gomez-Moreno's book, El Panteon Real de las Huelgas de Burgos (Madrid, 1946). 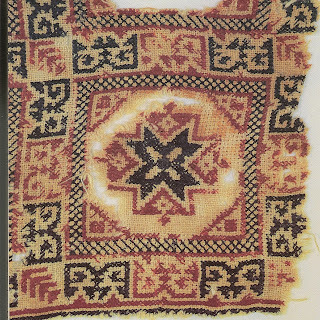 A fragment of an Egyptian Mamluk (1250-1517) embroidery in red, yellow, and blue silk on linen uses both herringbone stitch and cross-stitch. This fragment is currently in the Victoria and Albert Museum in London and can be seen in Marianne Ellis' beautiful book, Embroideries and Samplers from Islamic Egypt (Oxford, 2001). But are these "counted" cross-stitches? Well, yes, if you consider that you need to count threads in the ground fabric in order to make evenly-stitched and evenly-spaced cross-stitches. The modern notion of "counted" cross-stitch assumes that the stitcher is working from a chart or graph and "counting" exactly the number of various stitches in various colors. It is difficult to say, in many instances, whether a stitcher used a chart or not. Before the advent of printing, patterns would have had to have been handwritten. As far as I know, there are no existing handwritten patterns for cross-stitch. For example, was this design of two affronting birds stitched freehand or worked from a chart? We do not know. 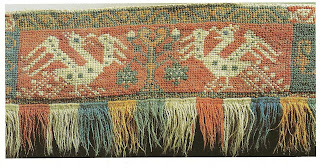 It was worked in four colors of wool on linen and measures, without the fringe, 13.5 cm (ca. 7-1/2") across the width of the band. It was possibly worked at Kloster Lune near Luneburg in Germany about 1500 CE. This and other fascinating embroideries from this cloister can be found in Horst Appuhn's book, Bildstickereien des Mittelalters in Kloster Lune (Dortmund, 1983). 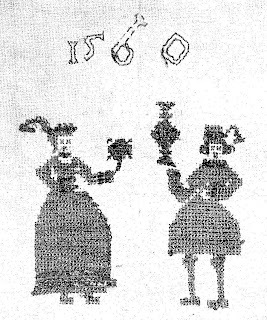 This charming little couple, from a handkerchief of possibly Moravian origin, was stitched on linen with red silk in 1560. The figures are worked in cross-stitch, and, again, we do not know if a chart of any sort was used. It seems quite possible that they were done freehand. The woman holds a flower while the man holds a cup or jug of some sort. The handkerchief is currently in the Moravian Museum in Brno. For many years, the embroideries that were done by Mary, Queen of Scots, while she was held captive by Elizabeth I were considered to have been done in tent stitch which is basically the first half of a cross-stitch and generally worked on canvas as a needlepoint stitch. However, close examination in recent years has shown that Mary's work was done in very fine cross-stitching. And this was definitely not counted cross-stitch: an artist was hired to draw the underlying designs on the fabric which Mary then stitched over. 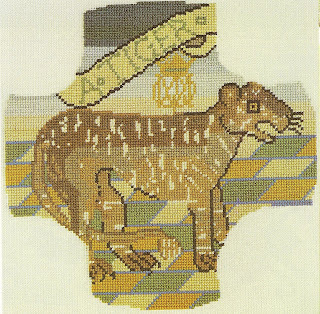 The tiger is an example of her work, one of many now hanging at Oxburgh Hall in Norfolk, England, which can be seen in Gill Speirs and Sigrid Quemby's book, A Treasury of Embroidery Designs (London, 1985). Arelate Studio has a current new line of designs based on Mary's original embroideries. Printed model books were popular by the 16th century, and eventually "samplers" became a popular form of embroidery. (Samplers are, however, not even that "modern": Egyptian stitchers were working samplers of various stitches as early as the Ayyubid period - late 12th to 13th centuy CE. See the Ellis book cited above.) This is a detail of the famous "Jane Bostocke Sampler", the earliest dated sampler. Now in the Victoria and Albert Museum in London with an excellent picture of the whole sampler in Susan Mayor and Diana Fowle's book, Samplers (Wakefield RI, 1996), Jane used a great variety of stitches, including cross-stitch. It seems very probable that she was working from patterns.